I finished this up yesterday while watching the Pats game and then Iron Man (Mike got the Iron Man Blu-Ray for Hannukah, and he just HAD to try out the Blu-Ray player on his PS3). I’m quite happy with the result, my first foray into millinery. 6) Continuing from my previous entry, after you have covered the top side of the brim, make the caul. 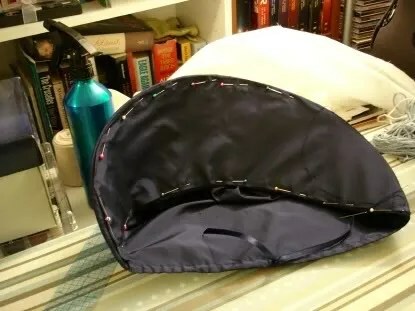 You have to make a drawstring casing in the bottom, as on the mockup. I made a hand-worked eyelet to thread the ribbom through. Secure some 1/4″ ribbon in the casing. 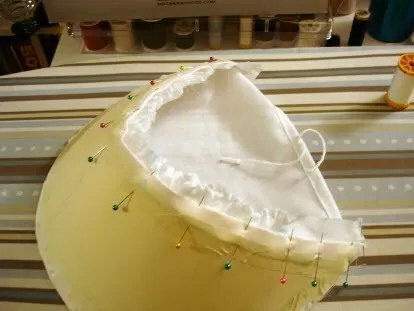 7) Gather the caul and then attach it to the brim, using a running stitch. 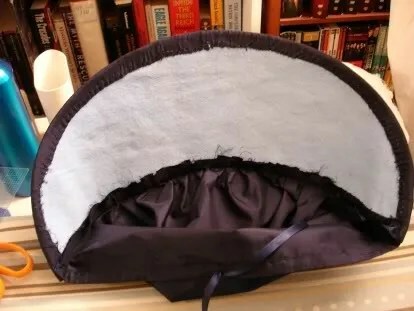 8 ) Cover the underside of the brim. 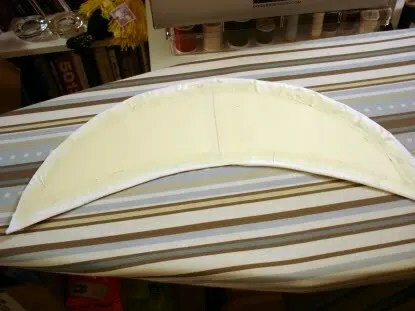 You can do this by cutting a piece of fashion fabric slightly larger than the brim, ironing under the seam allowances, and then whip stitching it down. 9) Try it on and take pics! 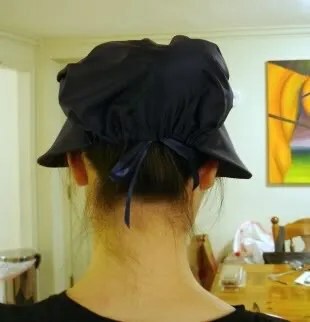 I’m trying to make a bonnet to go with my blue bib-front dress. I made the mockup last Thursday, and I have made the brim of the final version. I took lots of pictures, to share my trial-and-error process. 1) Trace the brim pattern on a stiff piece of paper, in this case, a file folder (this will be the “buckram” for the mockup). 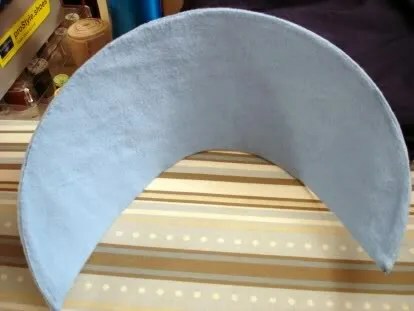 Draw the seam allowance along the brim and then trim it off. 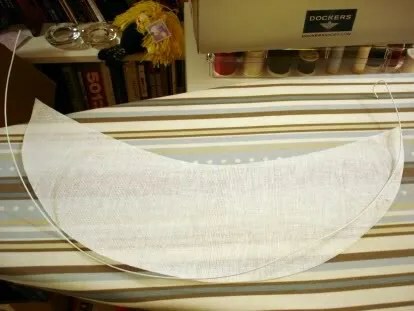 2) Cut the brim out of a piece of muslin (including the seam allowance). 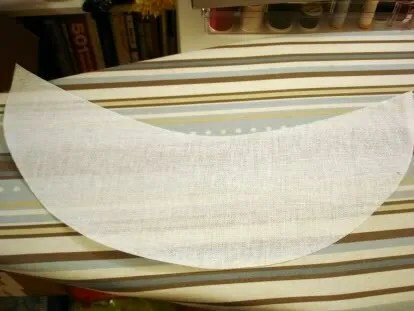 Attach it to the file folder brim piece by folding the seam allowance over the file folder piece and securing it with masking tape. 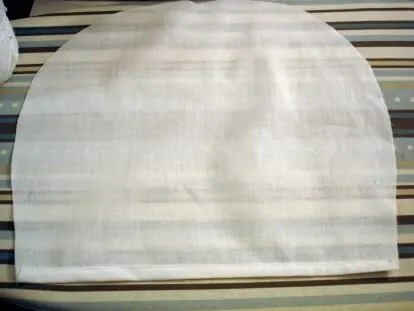 3) Cut the caul part of the bonnet out of muslin. Turn up the bottom edge twice to make a casing. 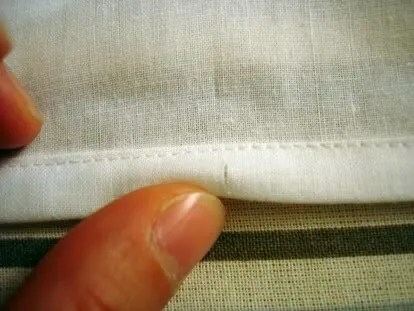 Sew the casing down. 4) Clip a hole in the casing through which the ties can be threaded. 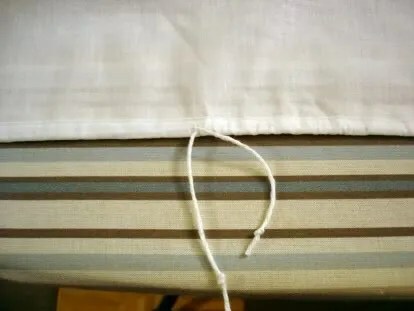 5) Use some scrap string as the ties. 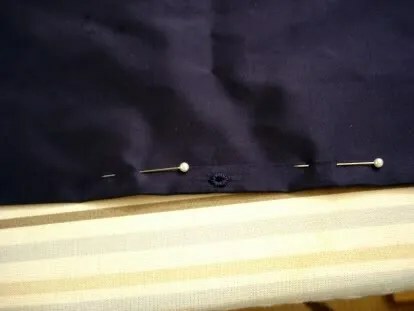 Thread them through the hole and secure the ends of the ties at the other ends of the casing. 6) Gather up the caul to fit the brim and attach it with a running stitch. 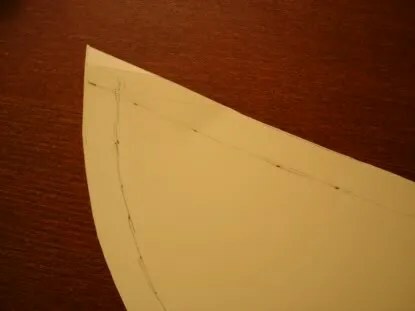 1) Using your cardboard brim from your mockup (you either have to take the mockup apart or trace a new one with any modifications you made), trace your final brim on your buckram and cut it out. 2) Cut a length of millinery wire to go around the outside edge of the brim. 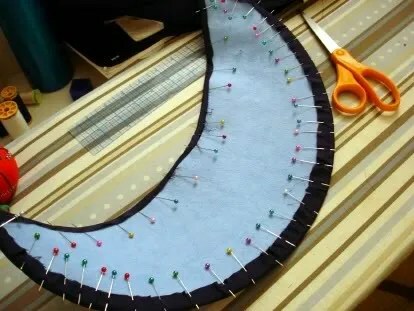 Bend it to shape, and sew it to the edge with some buttonhole twist and a whipstitch. 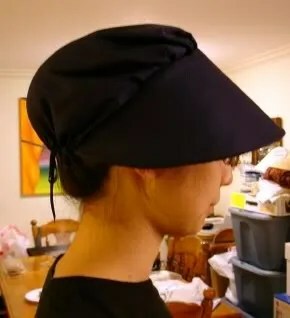 3) Cover the brim with cotton flannel. 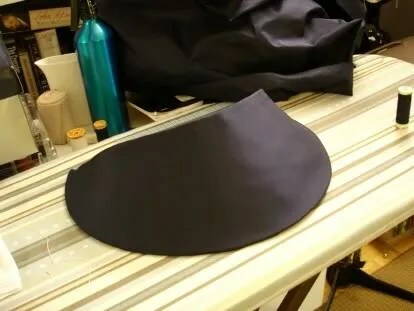 4) Cut out the outer (top side) covering of the brim from your fashion fabric and secure it to the brim with pins. 5) Set aside to finish later …..